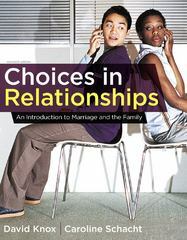 Choices in Relationships 11 Edition Built on the idea that the right choice is an informed choice, Knox and Schacht's CHOICES IN RELATIONSHIPS equips you with the knowledge and confidence you need to make wise decisions for a lifetime of positive relationships. By applying the text's concepts, and participating in exercises such as the text's self-assessments, you will learn how to approach every intimate relationship with the freedom and responsibility that comes from making educated choices. You will come away with the information that you need to explore the tradeoffs that choices involve, learn how to view situations in a positive light, and understand how not making a choice is really a choice after all.